I’m getting a lot of invitations to teach one-day and even half-day classes and I can’t decide what to do about them. It seems to me that there are plenty of quick project-oriented classes and tutorials around already. I can teach short classes and people enjoy them, but what really satisfies me is helping people fill in gaps in their skills and understanding so that they can become better artists. I feel this is my real strength as a teacher. I love to develop new techniques and share them with others but when I teach the techniques they are secondary to this broader goal. Similarly, I view projects as a way to put learning into practice, not as objectives in themselves. There aren’t many opportunities for this kind of teaching in the polymer clay world. It is the kind of teaching one would expect to find in an art school, but art schools have yet to embrace polymer clay in their curricula. Since each of us has been exposed to a different array of classes, tutorials and workshops in our journeys with polymer clay we lack a common ground of knowledge and skills. As a teacher, my way of dealing with this diversity is to keep my classes small, to try to understand what each student knows and doesn’t know, and to go from there. This takes time. I believe many polymer clayers would enjoy and benefit from this type of instruction; however, the trend is toward shorter classes, especially at conferences. My dilemma is whether to go with the trend or use my energies to develop another option, as I’ve done with my 6-day workshops. Right now, I’m trying to do both. Addendum: I think it would be great if there were a series of classes that ensured students would have specific knowledge and skills to serve as basis for future learning. The classes could be taught by different teachers all around the country but they would have a common curriculum. Hmm–maybe people who wanted to be instructors could go through a certification course (I think there’s one for metal clay isn’t there?) then teach the basics around the country. Is that what you’re thinking? Again, my MILTheda would have been so pleased with your idea. She believed that many art programs no longer teach “the fundamentals.” You and she would have been kindred spirits! A number of us teachers have discussed the idea of a series of “fundamentals” classes, but I hadn’t thought of doing it as a certification course. Great idea. I would LOVE to take your class, but I’d have a hard time dropping out of my “real” life (husband, kids, work, dog, etc) for 7 days (6+travel day). However I could definitely swing a long weekend! Maybe you could develop a 3 day workshop? I agree that a half day or even a full day wouldn’t really be enough to learn much more than a specific technique (ie. covering an egg with cane slices). I still hope to you learn from you one day when you get over to the north east (NYC area). I am working on a 3-day workshop but it takes me quite a long time to fine tune my approach. Thank you for your insight, Elizabeth. I took your 6-day intensive course and it was the best focussed workshop I have ever taken. It filled in my gaps, even though I have been claying for years. Actually just dabbling in polymer clay. After your workshop, I would suggest that anyone interested in expanding your knowledge of polymer clay and color theory to take you intensive. There would not be enough time for you to teach the shorter version. The students would not get nearly enough info and you would not be able to figure out what the students need. As for a certified teacher teaching the basics of polymer clay – this is a great idea. I know there are many polyclayers who would like to know this just to get going. We have one member in our guild who has a pasta maker but only just recently used it to become familiar with it and the clay. My suggestion is to weigh all the pros and cons of doing the short classes against doing what you love, sharing the longer version and really getting into the teaching process. I think I can speak for all of us at our workshop that it has really sparked all our imaginations. Do what you love and let the others who like to do the shorter classes to keep on doing them. Thank you for taking the time to write such a thorough response to my post. You have reinforced my ideas about what I should be doing. I’m so glad that you appreciated the workshop so much. yes, your idea sounds great! It does not all have to be project driven. An artist would gain and keep more more from an idea of a class like yours. Thank you so much for your encouragement. I’m told people don’t feel the way you do but I’m sure there are many out there who do. While nothing replaces the energy of an in-person class, I also appreciate quality onine classes where there is student interaction and instructor feedback. I also like a class where the content is downloadable for future reference. I would be willing to pay for a class that goes deeper than a tutorial. Both have benefits, but a class take the tutorial a step towards a finished product or ideas for using the skill in new ways. Thank you for sharing your thoughts, Kathy. I have to admit ignorance regarding online classes with instructor feedback. I should probably sign up for one. Any suggestions? I am in awe of your kaleidoscope techniques. I am in Australia. I am still fairly new to polymer clay but not to jewellery design. I love the possibilities of polymer clay and my creations are selling quite well in my local community. I would love to do one of your 6 day intensive workshops. You mentioned awhile back that you may come to Australia to do classes. That would be fabulous. I have been thinking seriously about coming to the States for one of your workshops. It may not be 2012 but I could come in 2013. Jenny, of course I would love to have you here in the US but I’ve also heard from a number of people who want me to come to Australia. Let’s keep in touch. I’ve taught some (not art); taken some that were art. Some just required photos if work in stages to be produce and discussed along with a related lesson, others held webinars and pencasts for real-time work. Maybe you and I could talk about the possibilites and content. Focus. I can see doing that type of teaching in order to educate as many people as possible or to make money, but for me, the in-person interaction with people is what I love the most and I don’t think I could give it up. should be considered also. Just another opinion. I believe you should do what makes you happy and do what you are best at doing. Don’t settle, as you will not be happy in the long run. Thank you Dean. I really appreciate hearing from you and I am thinking seriously about everything you all are telling me. A certification is a great idea. I would love to see certification levels from beginner to advanced. I think there would be a tremendous interest in this. I know there are a lot of teachers who feel the same way. Let’s see if we can make it happen. ….what a coincidence! You are talking about many things, I also have been thinking about lately. 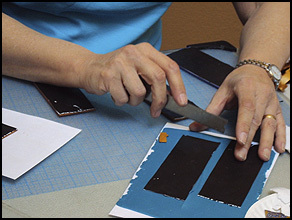 I much do prefer to take and also teach in my own classes technical workshops. But I do agree that what most students want is shorter project classes. I do think it is the “What you see is what you get” thing that is aplying here: people do want to know what they go home with! And that is not always clear when you do a technical class or workshop. When they come to conferences or retreats, they would rather have 5 shorter classes with 5 different teachers, then one long course with one teacher. The same does also aply to quality online classes ( I have experienced that with my online classes, too). I am not sure if I do like the idea of a certified teacher: Who would give out the certificates? It seams to be more of a money making thing with metal clay certificates, and that does not really help anyone. I don´t like that. And by the way: a certificate does not really proof anything. Some teachers give out certificates after there classes, but it does not make them any better or worst than they would be without that piece of paper! I would just love to have a week long learning or teaching experience in a setting you are describing!!! Thank you for writing Anke. I wonder if there aren’t different perspectives on this depending upon the length of time the person has worked with clay. When I started working with polymer I liked to take lots of classes at a conference or retreat and learn as many different techniques as I could. As time went on and I became more interested in refining my skills I began wanting longer, more focused, technique-oriented classes. I think there will always be more people in the first category than the second, which makes conferences with lots of short classes a safer investment for conference sponsors. I think there is a growing need for the other type of classes as well, though. The first national scale conference at Ravensdale offered both options. People could choose whether to take lots of shorter classes or spend an entire week in a smaller group with a single teacher. Even then, in 1996, both options filled. 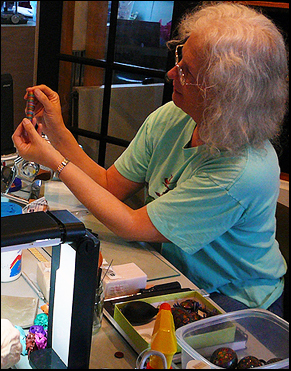 If a conference is intended to serve the broader polymer clay community both options should be available. If it is only intended to provide entertainment, get people started with polymer clay and make some money the short-session approach is going to be most successful. Carol, I have 2 of your pendants and earrings that I acquired at Shrinemont over the years, and have always admired your work. I am also at the point where I have been working with polymer for years and taken alot of short classes, to learn different techniques, but am still wanting more to take my work to the next level. The pictures I’ve seen posted of the results of your 6 day classes are phenominal. Your students get it. I think the promoters of a conference should consider the rest of us and give us the opportunity to focus instead of burning out on 6 classes in 3 days. The more different techniques I learn in a short amount time, the less I retain. Please keep doing what you love. We need teachers like you. I hope to someday arrange enough time away in my life to take your focused class. Diana, Thank you for the encouragement. The first Ravensdale Conference had an option where people could work with a single teacher for the entire conference, but as far as I’m aware it hasn’t happened since. I agree that there are people who would prefer this over a bunch of shorter classes. I hope conference organizers are hearing what people like you are saying. we’ve been thinking about this approach in the UK for a while and i would be very interested in pursuing it. I know people do love a one day class whether it’s technique or project lead but where to go from there? I believe you’re coming over next year and i would love to meet up with you? I think it would be great to meet up. I’ll be in the London area the 3rd week of September. carol, unless the short workshops are very physically convenient to where you live, i would suggest not doing them. any shorter than 3 days does not to your techniques justice nor really get folks where they see themselves. i say this as a “permanent beginner “caner. its your energy..and posssible burnout that i would be concerned about. very short classes perhaps should be offered only for folks who have already mastered with you, and come for touch ups, or inspiration. bizbee sounds wonderful, but im in a week horse training clinic in co. at that time. i am going to send a snap of my newest piece just fiy. i am dancing a line between keeping the form more important than the surface, being a sculptor and all, but it is a delicate balance. i need to get more comfortable with surface design and color, to make it eaier for me. i get the sculpture done, and pain and ponder over the surface. i know that you are one to be able to help me get over this. a week of work with you might be the only answer. Thanks for the wonderfully supportive comment. It is good to hear that you are still doing your horses. I’m looking forward to seeing a picture of the latest. This year I’m trying every type of gig imaginable: 1- 2- and 3-day classes; two intensives and the Birds and Clay workshop. I’ll be spending 5 weeks in Europe teaching 6 1-day classes, one 2-day and one 3-day workshop. Please do send pics of your recent work. I’d love to see what you are doing. I see money and leaving your real life (work family) as being the biggest obsticals in teaching long classes. I for one am very interested in the content that you speak of, but would prefer a long weekend fri-mon. Factoring travel time. The idea of certification classes is good but starts out with the certification of the teachers. Consistent classes would be paramount. I would think hooking up with one of the clay manufacturers for this might work. Currently I work in polymer clay and love to take classes but would really like to take a class that would help me to develope my own style as opposed to learning to make one item the someone else came up with. It sounds like the class you speak of would be more along that line. It will be exciting to see what you finally come up with. Good luck. Thank you for the comment. I’m trying 3 different class formats this year to see what works. I’ll be teaching the 6-day workshop just outside Atlanta in about 10 days. I don’t know when I’ll be back. Thanks for commenting. I think a students goals for using polymer enter in to whether they are more interested in a shorter project oriented class or a longer intensive. Goals for students who are looking for classes can vary on a broad spectrum from looking for entertainment and fun, a creative outlet to add balance to life, a wish to become a better artist, to persueing art as ones primary passion in life. I think there are simply many more students at one end of this spectrum than the other, so there are fewer opportunities to teach to that smaller pool of students who want an intensive. This is not to say you should not continue to do it! I do think that your approach to finding interested students will need to be different than the classic approach used by those who are teaching classes for people looking for entertainment. 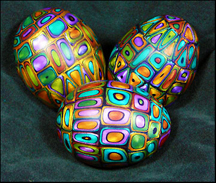 The students you are looking for may not necessarily be a part of “the polymer clay world”. You may need to look elsewhere in order to fill those classes. Thanks for your insights and taking the time to comment, Laura. I think you are right about there being 2 groups of students and the difficulty of finding the ones that want in-depth learning through the usual channels. I’m finding mine mostly through this site, facebook and word of mouth. Once you find them, they are committed, though. 3/4 of the students in my first 3 intensives have opted for a 6-day follow-up workshop in 2013 to build on what they have learned. That’s enough for 2 workshops! I agree with different aspects of comments already shared on varying goals of participants. I’ve signed up for, and am looking forward to your class at Creative Journey on 3/31. I am on the board of our local polymer clay guild (GAPCG). My original class in this medium was at a lapidary school in Young Harris GA that I have attended over the last four years called William Holland. I took a metal clay certification class there as well. Each class is a week long in that one skill set rather than switching around. For those serious about their art whether it be for personal satisfaction, or for business goals, this seems a very good way to get some good skills set with like minded people. They have attendees that travel from far and wide to attend. There is a variety of courses available and with the show and tell session you can see what other classes have been learning and creating during the week. That is often when I decide what I will take next year. In the metal clay class I took, which was for PMC certification, there was a specific set of criteria for each project that was examined and graded by the instructor before you could receive your certification approval. I didn’t realize this when I signed up for the class as this was the only class taken there that was truely a certification process rather than a “slip of paper given to everyone at class end”, but I was glad that I learned each of the skills covered. Before the economy went south, I work by day in the development and residential construction community, I would travel each year outside of the US for personal entertainment. For the past several years I can’t swing that due to cut backs in both vacation time and salary, but I use my limited allotment of vacation time & money to take a week long course at this lapidary school learning a new skill & then I fill in the rest of the year with local workshops & guild activiites when I can. This April I’ll be learning how to enamel as my new week long skill set. All that being said you may want to look at teaching at some of these type of lapidary schools and other extended stay type art programs. As artist are slowly learning about the incredible possibilities of the polymer clay medium I have the feeling that there will be more and more individuals seeking the type of course you describe. Yes it will not eliminate the short term workshops, but rather compliment it for those that have gotten their feet wet enough to decide they like the medium and want to pursue it further. Thank you for joining this discussion, Connie. I hope you are right that there will be increasing interest in this type of learning. I’ll look forward to meeting you on the 31st.